Summary Aggressively-priced D2550 Atom-based five-drive high-performance BYOD NAS with USB 3.0, HDMI & audio I/O ports. 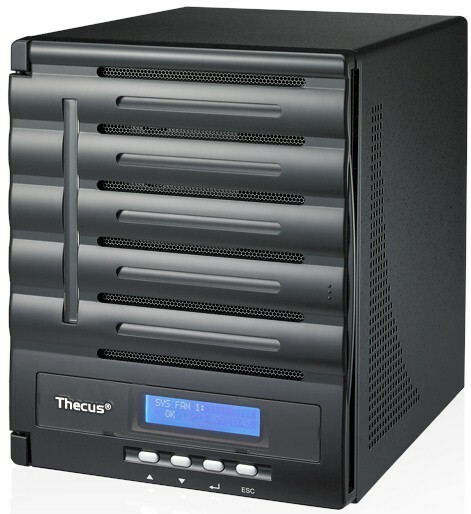 Thecus recently upgraded its five-bay NAS line with a model based on the Intel D2550 "Cedarview" Atom platform. Today I'm taking a look at the five bay N5550, which looks very much like the N5500 we reviewed back in 2009. From the front with the door closed, the N5550 and N5500 look almost identical, with just a simple change to the logo. Inside the drive door you'll find the power switch, reset button and USB 3.0 port (the N5500 has a USB 2.0 port here). The main port changes are on the rear panel, where audio connections have been added, as well as an HDMI port. You might notice that the USB 3.0 port is only available under the front cover and not on the rear of the unit. This makes for very inconvenient access if you plan to attach a backup drive. On a more positive note, the N5550 is designed for easy servicing. Removing three thumbscrews and two VGA connector fasteners lets you pull off the back panel and detach the single fan connector to completely free the back panel. The cover then lifts off to completely expose the board. The N5550 is the first NAS we've seen that makes it easy to replace both the main board and drive backplanes. The backplane is held in position via pins on the drive bay frame and secured via standoffs on the back panel. On the photo below of the N5550's main board, we can see the 2 GB DDR3 SoDIMM, as well as the heatsinks that cover the 1.86 GHz Intel Atom D2550 processor and companion device. You can't see it in the photo, but the SoDIMM socket is two-level and there is an empty slot hidden behind the factory-installed RAM. Thecus says you can expand memory to a total of 4 GB. The part marked "Industrial MDS module" is a 1 GB flash Disk on Memory (DOM). Just to the right of the DOM is what looks to be a mini-PCIe slot. Like the N4800 reviewed back in May, there also appears to be a PCI-e X1 connector to the left of the DOM even though the N5550 spec doesn't mention an expansion slot either. Table 1 summarizes all the N5550's key components. The design shares a few things with the much higher-end TopTower N6850 reviewed a few months back, including dual Intel WG82574L Ethernet controllers, Silicon Image SiI3132 providing the fifth internal SATA and one external eSATA ports and NEC D720200AF for the USB 3.0 port. We didn't remove the heatsink to identify the D2550 Atom's companion device and couldn't find any clues in the system's boot messages. But the Atom D2000/N2000 datasheet shows an Intel NM10 Express Chipset in the block diagram, so that's our best guess. The NAS came diskless and was equipped for testing with four Western Digitial Red 3 TB WD30EFRX drives on loan from WD. Power consumption measured 39 W with the 4 drives spun up and 26 W with them down via the programmable idle drive power save feature. Fan and drive noise could be classified as medium-low, since a low whirr could be heard in a quiet home office. The N5550 was upgraded to 2.03.04.atom firmware before testing. Since Thecus standardizes its feature set across its products we won't be covering the features here. But a quick look at the N4800 review will provide a good overview. Additionally you could give the online demo a try to really get a feel for the user interface.